Ads are the bane and the boon of the technology industry. Where on one hand, they help generate revenue due to which many companies have been able to offer their services for free; on the other hand, they reduce the desirability of any software or website that contains them. As George Carlin put it- ‘It is the basic NIMBY law- “Not In My Back Yard”. However, companies like Google have proved that ads are here to stay and if utilized correctly, advertisements are an incredible source of revenue. Until now though, Google had not put ads on the Gmail app for Android. This simply means that it is due. Android Police recently tore down the apk of Gmail app and opened the Pandora’s Box of all the goodies to be offered in the future. 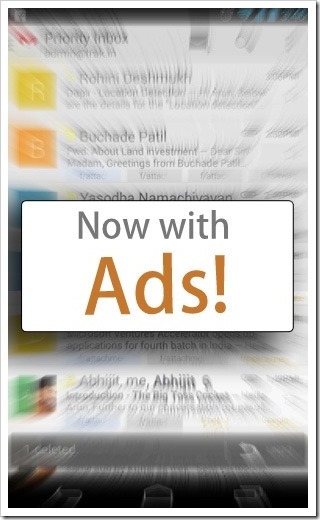 The first and probably having the most significant impact is that ads will now be part of the app. While it is not clear what will be the kind of ads that a person will see in the mobile app, it is sure that we should see them in a short while. Also, if you like an ad, you will be able to save it and if not then you can simply dismiss it. At least that is what seems till now looking at the following references found out by Android Police. A whole new library has been added as well to show the ads- com/google/android/gm/ads/. All in all, we can say that ads are going to be part of the Android app for Gmail soon. Let’s hope they are not intrusive and do not render the user experience crappy. Besides this, a very useful feature is going to be added in the app. With this, whenever the Sent folder is opened, a warning will be displayed about how many emails are in the outbox stuck. It will be immensely useful as it so happens many times that we send a message and it never reaches the destination. A few more changes are visible including UI changes. What do you feel about ads coming to Android? Do you think they would impact your usage of Gmail? Have the ads in website affected your productivity?